The journey over showed us some ominous grey clouds and also a worrying lack of hills until the last couple of miles or so, when the sun peaked out and we found ourselves driving down the steep descent of Fish Hill. We had seven three peakers on the walk, one long-suffering boyfriend and two dogs, Hugo and Barty, taking on the route up to Broadway tower then continuing to the village of Snowshill. The views from the top were spectacular and we stood there for a while catching our breath and eating chocolate whilst working out that we had done about 1/7th of the height of Ben Nevis and assuring ourselves we could definitely have gone up to the tower 7 times in a row…we hope! With the help of our smart phones (what would we do without them?!) we worked out which way we needed to go and carried on towards Snowshill village, walking past some incredible houses, through quiet woodland and down into a very peaceful valley. The navigation side of things went fairly successfully, with only one minor detour when we missed a footpath to our left and had to climb up a very steep bank to find it again! The last hour or so of the walk was thankfully flat and easy, following a civilised track back to Broadway and left us feeling positive and raring to go. 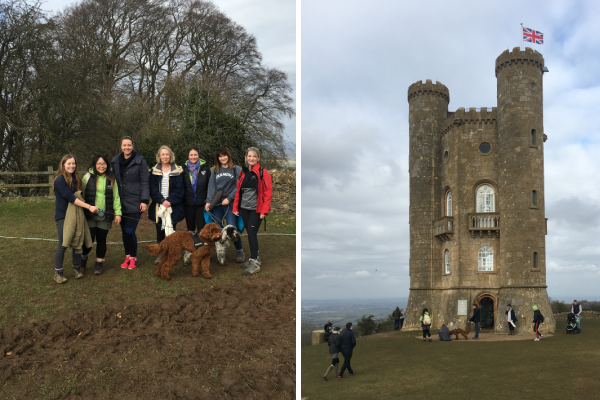 We all learned lots from the training walk – finding the right boots, not wearing a huge coat (so hard when you get out of a heated car into a chilly wind!) and keeping our posture upright to help with breathing.